Ebonyi State University, EBSU supplementary admission application form for the 2015/2016 academic session is out. 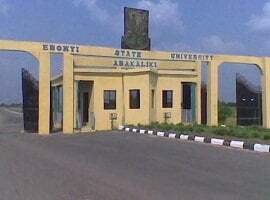 EBSU Supplementary Admission – Available Programmes. Applications for supplementary admission into Law, Medicine and Surgery, Medical Laboratory Sciences and Nursing Sciences will not be accepted or processed except as concessional request. To download EBSU 2015/2016 Supplementary form, visit EBSU website: www.ebsu-edu.net. Click on Supplementary form link. Input your EBSU UTME registration number. Download the form and complete it as appropriate. Upload your passport photograph. Then click on submit. After submission, print your acknowledgement slip. N/B: Ensure that all fields are completely filled. @Chinazom, Kindly ask all your questions here again.